The mind is such a powerful thing, and if left uncontrolled, causes all kinds of damage. This book shares practical advice on how to control the thoughts we think, put a guard on our heart and be careful of the words that we speak. The truths shared here are ones that all Christians should be living. Author Carol Burton McLeod shares Scripture, real-life stories and practical application questions to help Christians in their spiritual growth. She offers strategies for countering the lies of the Enemy of our souls. It is clear that she has a desire to teach Christians how to live victorious lives. A couple of caveats. . . In the chapter “Are There Two of Me”, she talks about the war between the flesh and spirit, however, it sounds like she is saying that the spirit is good and the soul is bad. I assumed I had heard her wrong and read further only to see her mention that a particular bad action came from the soul, not the spirit. I have a problem with this because even David prayed for God to “renew a right spirit within me”. If he had need of a renewed, right spirit, then his spirit was not well and pleasing to God, which contradicts what the author was saying. This said, the concepts that she was teaching are valid, as long as you don’t equate the good with the spirit or bad with the soul. There were also some hints that we can expect God to speak to us outside of His word. She mentions a time that God spoke to her mother. While I had had times I felt that God has spoken to me to draw me to Himself in salvation, it is vital that we listen to the things He has already spoken in His Word and let that be the guide for our lives. The Bible is complete; there is no need for God to add to what He has said. In “A Brand-New Brain”, she says “We have the miraculous ability to receive the wisdom of the ages.” and “We can have God-sized dreams and divine creativity in our pea-sized brains!” This sounds very New Agey to me, and I caution the reader to not interpret that to mean that we can understand mysteries that are not explained in Scripture or to think that we can be “like God” (think Garden of Eden). He has promised us wisdom if we ask, and has promised us the “mind of Christ”, but not extra-Biblical revelation. As with everything you read or Christian speakers that you listen to, be sure that you go into them with your Bible right there, and if something is being taught that is a new concept to you, check and make sure that is what the Bible is saying. Read the verses before and after those presented to see it in context. Don’t assume that if the author is a Christian, everything they share is consistent with the Bible’s teachings. Be the like Bereans in Acts 17 and search the Scriptures to see if these things be so! 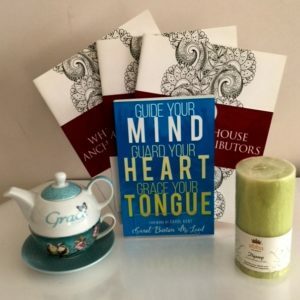 Thank you for your review and information on “Guide your Mind, Guard your Heart, Grace your Tongue” by Carol Burton McLeod as well as for being part of the book tour.